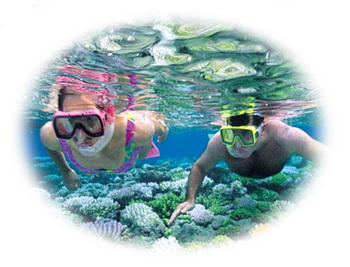 Along with scuba diving, Akumal is also known for the close to shore, easy access snorkeling that it offers. While a short boat ride to the outside of the barrier reef and into the open waters of the Caribbean Sea provides access to deeper waters for scuba diving, the areas located between the barrier reef and the beaches of Akumal are much shallower, which makes for excellent snorkeling. Within the shallow bays of Akumal, is an abundance of thriving marine life including; sea turtles, a wide variety of tropical fish, and numerous species of coral, making for incredible, aquarium like snorkeling areas which are accessible directly from Akumal’s beaches. The snorkeling areas in Akumal include; Half Moon Bay, Akumal Bay, Jade Bay, South Akumal, as well as Yal Ku Lagoon and Aventuras Akumal. If staying in one of these locations, there is direct access to snorkeling. The barrier reef in front Soliman Bay offers excellent snorkeling which can be accessed directly from the beach, however, the distance from the beach out to the barrier reef is further than in Akumal, but is still within swimming distance for a good swimmer. It can also be reached on a kayak, which most of the properties at this location provide. The sea is very shallow at the waters edge and continues to be shallow for quite a distance, very gradually deepening the further out that you go. Please note that the dark areas in the water in the above photo is Turtle Grass which is not harmful. If you find it bothersome to walk on, most properties have a narrow pathway from the beach to the other side, where you can put on your mask and fins and begin snorkeling. Whether you have your own gear and regularly snorkel while on vacation, or you have never been, you’ll find the snorkeling in Akumal to be world class. For those that don’t have their own gear, the dive shops in Akumal have you covered; renting gear by the hour, day, and by the week, as well as offering snorkel lessons and guided snorkel tours. See “Dive Shops” in our Service Listings for more information. In addition to the shallow bays in Akumal and located just to the north of Half Moon Bay is the beautiful, Yal Ku Lagoon. While the coral reefs in front of Akumal provide one type of snorkeling experience, the lagoon, with fresh water entering from jungle side caves and crevices, along with the sea and tropical fish entering through a natural channel, provides a completely different aquarium like snorkeling experience. When snorkeling in the lagoon, it is common to experience sudden changes in visibility, with some areas becoming quite blurry, however, as you move to another area the waters will typically clear. This is a completely natural phenomenon referred to as the “halocline effect” which is caused by the fresh waters entering through sub-aquatic caves mixing with the salt water entering from the Caribbean Sea. While there are always areas within the lagoon that this occurs, it is usually most clear in the mornings and when there hasn’t been much rain. Yal Ku Lagoon is open from 8:00 until 5:30 daily. The entrance fee at the time of this writing is $14 US, per person; however, if you are staying directly on the lagoon, there is no charge. There are showers as well as lockers for guests to use, though parking at the entrance is limited. Even if you are staying elsewhere in Akumal, the experience of snorkeling in Yal Ku Lagoon is well worth taking the time and paying the fee; some of which goes to maintaining the healthiness of this unique, underwater environment. For those that seek a snorkeling experience that is unique unto itself, the jungles of the Riviera Maya are home to countless fresh water caves (locally referred to as “cenotes”). Filled with crystal clear water, these underground environments offer some of the best cave diving and cave exploration in the world. While diving these caves takes a tremendous amount of training and special certifications, snorkeling only requires a mask, snorkel, fins, and a sense of adventure. 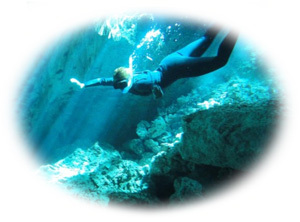 To experience snorkeling in a cenote, Travel Services of Akumal offers tours from Akumal to several cenotes in the area. Elsewhere on the coast, most of the large ecological parks on the Riviera Maya are home to at least one cenote. If you have a rental car and see a sign for a cenote, pull on in and say “Hola”! That along with a few Pesos will often get you a local Mayan, leading the way to a cenote that is still buried in the jungle. Don’t forget to stop by one Akumal’s dive shops and rent your gear before exploring the Riviera Maya, as many of the places that you visit are likely have snorkeling; either from the beach, in a lagoon, in a cenote or cave in the jungle. 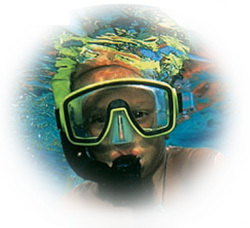 Snorkel gear can be rented by the hour, by the day, or by the week. With so many snorkeling opportunities on the coast, many guests stop by one of the dive shops soon after arriving in Akumal and rent gear for the duration of their stay. If renting gear, be sure to visit our Service Listings page for dive shop locations and hours.